What is LG Sciences 1-Andro? 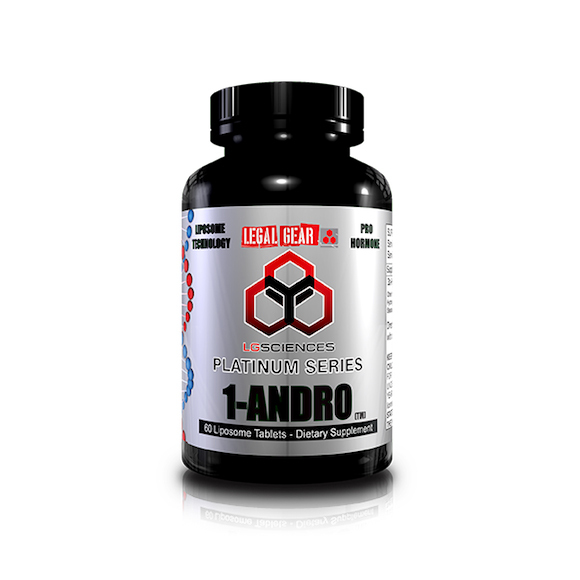 1-Andro is a prohormone product designed by LG Sciences to help you get the most out of your gym routine. Experienced prohormone users may stack this product with other prohormones and supplements when running a prohormone cycle. Because it’s designed to increase strength and lean mass while shrinking fat, it’s a core component in the LG Sciences Bulking Kit and the LG Sciences Andro Cutting Kit - two of the best prohormone cycle kits available on the market today! On its own, 1-Andro by LG Sciences can serve as an excellent introductory starter product for the male weightlifter who is starting to get serious about prohormones and the gains they can help achieve. Whether you’re new to prohormones, or veteran who knows exactly what you’re looking for, 1-Andro can help you gain lean mass while trimming your figure of excess fat. 1-Andro works by converting in the body to 1-testosterone and helping to release lean muscle anabolic gains. 1-testosterone was one of the best and most popular anabolics on the market until 2005 when it was banned by the FDA and DEA. When coupled with proper exercise and diet, it has been shown to bring even more anabolic increase than testosterone. You know it’s serious when WADA (World Anti-Doping Agency), the agency that oversees substance testing for the Olympics and Tour de France, have it on their list of substances that provide an unfair advantage for competitors. LG Sciences has designed 1-Andro to undergo a two-step conversion process that results in...you guessed it, 1-Testosterone. Unlike other prohormones and pre-prohormones, it does not convert to estrogen or DHT, meaning that you keep the gains you make, and like other LG Sciences products, it is liver-safe! If you’re wondering about the bioavailability of 1-Andro, LG Sciences and Hi-Tech are one step ahead of you with their proprietary Cyclosome™ delivery method. Keep reading below to learn about how they have taken a scientific and measured approach to one of the most significant issues with prohormone products. Having a great product is worthless if your body can’t absorb it. LG Sciences stands above the competition for a straightforward reason - they have the best and most efficient delivery method for prohormone products. Cyclosome™ technology is designed to allow your body to absorb more prohormone than with other delivery systems. This new technology is designed to get you more results with lower dosages and protect your liver from harm. When prohormones are processed through the liver, much of the dosage can be metabolized and wasted. LG Science’s proprietary method skips the liver stage and enters the bloodstream through the intestine. This massively increases the bioavailability of 1-Andro, or how much of the prohormone is able to be absorbed by your body. It also means that your liver is not at risk! If you’re ready to crush your PR and dominate every set on your way to clean gains, choose 1-Andro. You’re be covered by our storewide, 30-day money back guarantee, and you’ll enjoy automatic free shipping with the order as well. As with any supplement product, do your research and consult with a doctor. These products are intended for healthy males over the age of 21 only, and all benefits are theorized based on a proper diet and exercise routine. As with all prohormone products, please keep in mind that your natural hormone levels can fluctuate once you finish a cycle. We encourage users to run post cycle therapy to restore normal hormone levels, so you maintain all of your gains. Check out the LG Sciences Form-XT, our best selling PCT, for all your post cycle needs. doses with or without food.